Baxters Canada Inc., in cooperation with the CFIA, is warning people to refrain from consuming their “Primo Hearty Chicken Soup”. The specified product is said to contain milk that has been undeclared in its list of ingredients. The manufacturer of the chicken soup, Baxters Canada Inc., has announced a recall for the product. The company is currently making sure that none of the affected product remains displayed in retail stores. The CFIA, on the other hand, is making sure that the product recall is an effective measure in preventing people from being harmed by consuming the product. Currently however, there have been no allergy attacks or other medical emergencies that are linked to the recalled chicken soup. 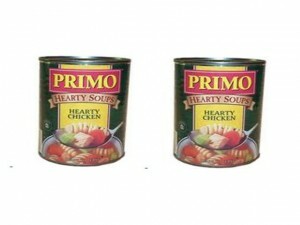 The recalled chicken soup has been distributed to retail stores nationwide. It is packed in 525-ml cans and has a UPC code of 055900005549. The batch’s lot code is EST 14223569230. The chicken soup cans contain minestrone, which includes milk as its ingredients. Milk is a common food allergen. Although a beneficial and healthy kind of food, a significant number of people around the world are hypersensitive to milk in all of its forms. People who are lactose-intolerant or have allergies to it might experience allergy attacks when they consume this milk-containing product. In worse cases, a simple allergy attack can lead to serious health risks, especially to those who have weakened immunity. People who want to know more information regarding the recalled soup product can call CFIA’s hotline at 1-888-797-3210. To know more about the different kinds of food allergens, consumers can also visit http://www.inspection.gc.ca/english/fssa/labeti/allerg/allerge.shtml.